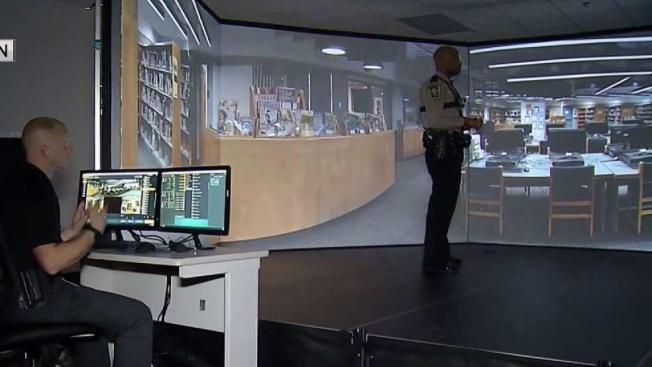 Since the deadly school shooting in Florida, local law enforcement are keeping focused on their training and one Virginia department is using a high-tech simulator to put its officers in realistic shooting situations. In the basement of the Stafford County Sheriff's Office, Deputy Justin Howell turned in his service weapon, magazines and stun gun before walking into the virtual world. Inside, he loaded a compressed air gun and stepped onto a stage in front of a 300 degree screen, entering school mayhem that's all too real. “Hands up hands up! He went that way! Inside the building? Outside the building?” Howell yelled during the training. Some of the simulation is disturbing to watch. The simulator's floors vibrate and deputies wear devices similar to stun guns to replicate the feeling of being shot. “You’re definitely on the edge I would say,” Howell said. “This offers an array of options for us to train our people to be more effective and to be, you know, highly professional law enforcement officers in the field,” Stafford County Sheriff David Decatur said. Decatur said the simulator also teaches officers de-escalation. "Any type of force you use you have to be trained and understand case law, understand when it is appropriate, when it is reasonable,” he said. Howell said he hopes he will never have to take the virtual skills into the real world. “I train myself to believe it is real and not a game," Howell said.